Organized beach fun is a big feature by Playa de las Americas. Trampolines and all kinds of seaside fun gadgets are seen. 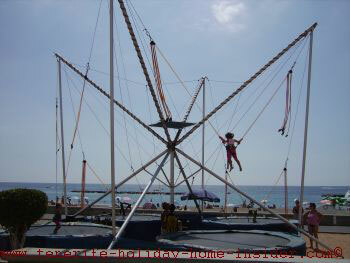 However, the oldest Tenerife resort has its own ways for beach party fun, as you will discover. The child in the trampoline photo is obviously having a very good time, while high up in the air. Swimming in a Garachico rock pool is part of traditional beach pleasures. So is snorkeling or just splashing about, as is possible in some of its natural basins with a very low tide. Learn to juggle, like this young man on beach Playa de las Teresitas by Santa Cruz. A pretty young lady is looking on in fascination. A fantastic way to amuse yourself right by the water's edge. It's also a good alternative to the usual beach sports... By the way, getting good at the art of juggling may help to earn some extra income with it. What you can't hire, you can buy for seaside amusement. 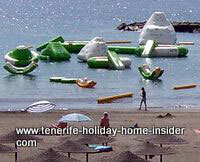 The gay floats by the seashore are for rent at Playa Colón of Tenerife South. Playa de las Americas has more and so have Los Christianos beaches. Rubber boats at Playa Las Vistas are popular too. Encounter fly-fishing and snorkeling gear at Alcampo, Corte Ingles or at little sports shops in towns. In 2009, there was a fun beach celebration of San Juan/summer solstice on the 23rd of June in the oldest Tenerife resort Puerto Cruz. I attended it and was amazed by the crowds which wanted to enjoy it. The event is celebrated yearly. Mind that the solstice cannot be pinned down to the same exact date and moment every year. So it may occur on the 24th just as well. Anyway, I prefer private 'Sonnwend-parties'. Those delightful Germanic equivalents have been organized twice yearly by a friend at his own seashore by El Sauzal for many years. He also told us quite a bit about related Guanche rituals on beaches of that time of the year. Goats provided more than laughter, by the way. Anyway, the June solstice, San Juan and the following bathing of the goats have all been fused, in modern times. All boils down to mega beach fun, now. How is San Juan day celebrated? Much Leña (firewood) is piled up by the Punta Brava seashore or on other Tenerife seasides. However, impatient people start their own bonfires, long before the municipality lights the big heaps of timber. Making any fire near the ocean's edge at night is so exhilarating, you know... Provide your own private beach fun, as is depicted by a small fire beside... Cheerful dances, silly actions, singing, and much fooling around are often part of that kind of merry go round. Live , loud Salsa music or other trendy tunes are organized by the town event management. A big concert podium under a half open tent is mounted every June. Bring your guitar. You may be invited to play, too. Some people arrive in the afternoons already to secure a good spot. Others come at night. Most are loaded with picnic goodies and much beer. Strangely enough, the beach fun gets rarely out of hand, so I am told. The yearly bathing of the goats by the Puerto 'Muelle' of its tiny port in the morning after the summer solstice dates back to Guanche rituals, as said. In fact, sun and stars were studied by the Tenerife natives, as revealed by the Piramids of Guimar. The Guanche calendar marked June 21 as the beginning of their New Year. Hence goat bathing couldn't be forgotten. Those natives had ways to distract themselves merrily. This included a Santa Cruz beach where even witch coven took place under a full moon, as you can spot here. Mind it's a legend but, not the only one in that context. Even Guimar history tells about it. 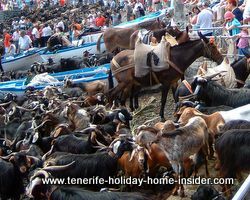 The spectacle with the goats has lived on over centuries by the little port of Puerto de la Cruz. Go to El Puerto's harbor early in the morning after dancing the night away by the gay San Juan fun playa event. The animals seem to like their goats bath. The beast, some of which have ornamental necklaces, stop their excited bleating when all is over, though. Then they stand calmly on the harbor pebbles, all perched up by the cool walls. None are secured to anything. There are no ropes, no chains. Most of the shepherds just leave them like that. They do that when they take refreshments in a bar nearby. I don't remember dogs but there must have been. Amuse yourself with your kids and mingle with the goats there. They are rather funny creatures. Comfortable shoes are a must. Want to see more beach fun of this sort? The beach promenade of Playa de las Americas gives you 9km of beach front fun facilities for pavement sports. All kinds of skating or just contemplating people or the ocean scenery excel. Join more excitement on the sand where more and more fun is being invented. Some of it is hilarious. Cool down with happy splashing in the sea. Admire the seaside beach mini golf which is part of a large course by Los Christianos. Encounter more of such facilities by several other Tenerife shores, most of which are for proper golf. Beach promenades also invite for bicycle rides. Romance by beaches starts with leisure walks, horse rides, long drinks, watching sunsets and even getting married by the water's edge. Some people play computer games or favorite music with their i-phones or tablets while sun bathing in the sand. They also have fun chatting with loved ones far away for free. Beaches like Playa el Socorro of Realejos, Playa de la Arena of Los Gigantes and other Southern shores enchant with free WiFi for locals and tourists alike. Tenerife beach fun entertainment is not only organized for the amusements of local youngsters and tourists. Everybody loves gay open air partying by a seaside. A volley ball practice, as depicted here, adds beach fun for sporty children. Find the practice grounds marked on the Playa Jardin getting around map. Beach sports galas are of course very popular. 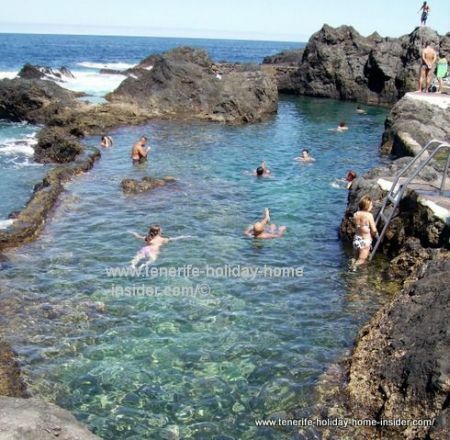 Garachico has the most inviting rock pools called charcos for the fun of tourists and town. A beach bar tops the fun. Does it matter that not all of such beach side pools are free for all, such as Lago Martianez with its underground casino for entertainment and gambling fun? Los Gigantes rock pools for men and beast are free and even allow water fun for your dog, while he may howl at the moon. Tenerife is very good in adapting Spanish traditions of religious nature for occasions, which bring about much laughter. The holiday Fiesta del Carmen makes you more than smile, when you see a church statue balanced around on the waves in a flower heavy small boat. More about it with photo at Tenerife holidays called Fiestas which include seaside excitement. .
Before Christmas 2008, an enterprising company set up ice skating by the little harbor beach of the oldest Tenerife resort. An amusement park is in Puerto Cruz every winter. The fair with carousels provides its own beach fun and is there every year. See its amazing assortment beside. Otherwise, little is needed to have a good time by a beach. Some are building sand art with bare hands. or their play mates while at it, having thrills. Even, adults think it's comical to bury themselves in the sand. Washing off black Tenerife beach sand in the ocean tops the fun, afterwards. Meantime, more and more games and sports are invented for more thrills by the ocean's edge. Take note in the town hall news that this 2014 beach festival is not only the Flypa, but also the beach El Socorro Teide Marathon as well as the Surf Trophy Rector championship from May 02-04 all on the same Realejos beach. Concert events for beach fun are always part of a public holiday by the Tenerife sea shore. Go there and be merry with live Rock and roll, Jazz, Salsa and Merengue concerts and above all, with yourself. 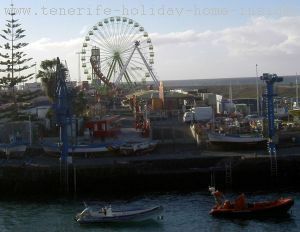 Puerto de la Cruz the oldest Tenerife tourist resort has a couple of beach fun pavilions by Playa Jardin. They were set up for bands and beach concerts, but are not used during Fiesta San Juan. Every beach festival is followed by miraculous fireworks on a shore. All adore them. Beach playground at Playa Jardin. Playa Jardin has a good beach playground with amusement equipment like slides, climbing towers etc. for the very young. It's not part of an aquapark, though. The Martianez lake fountain and jacuzzi fun is more like it. Watch young people at Punta de Hidalgo beach who create their own water thrill by simply standing at the barrier fence of artificial pools. They wait for waves to splash and hit them. This is very simple but effective joy gathered by contact with the ocean. Seaside lighting at Playa del Duque for party amusements at night. Party fun is enhanced and extended at night by a lamppost, such as this olden day version, which stands in the Tenerife sand not that far from the ocean's edge. This location is also known for happy seashore champagne breakfasts which are organized by some resorts. I still remember their elegant waiters with their red scarves wrapped around the waistline, while the white shirt and black pants set it all off. That was Las Americas beach in 1997. Watch a video of a cool seaside party at Playa Paraiso which is part of beach entertainment of attractions of Tenerife which include whale watching, swimming with turtles, a private boat tour off Los Gigantes, a folk music festival and more. Delightfully silly beach events are provided by the burning of the 'sardine' which is one of the islands' end of carnival high lights. 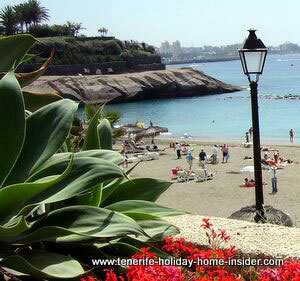 This humorous affair is an old beach custom of Puerto de la Cruz and other Tenerife seaside towns. From beach fun back to Tenerife beaches of north and south.